The Syrian army has crossed the Euphrates at the town of Mayadeen south of Deir Ezzor. Will it move further east to take the large Omar oil field and block US-Kurdish forces or simply continue moving south down the Euphrates valley? Three years ago, the Syrian Arab Army was withdrawing from much of eastern Syria, with little hope to hold onto the provincial capital of Deir Ezzor. However, that would all change in late September 2015 when the Russian Air Force began its aerial campaign against the terrorist groups occupying large parts of Syria. With today’s liberation of the Islamic States (ISIS) de facto capital, Al-Mayadeen, the Syrian Arab Army is in prime position to liberate the Deir Ezzor Governorate’s largest oil fields. The Al-‘Umar Oil Fields have been one of the Islamic State’s most important revenue streams; its liberation is now one of the Syrian military’s top priorities in the Deir Ezzor Governorate. I don’t know if [Al-MAsdar's] Leith Fadel knows the R+6 will cross the Euphrates and drive the ten to fifteen kilometers due east to occupy the Omar oil fields or if he’s just making an educated guess. If sufficient mobile forces can be pushed across the river quickly, this would be a wise move. The real prize is still Al Bukamal, but a Tiger Force presence in the Omar fields would pretty much scotch CJTF-OIR plans to push the YPG/SDF to Al Bukamal ahead of the R+6. Then the R+6 could take the rest of the Euphrates valley and Al Bukamal at their leisure. I believe it is well within Tiger Force capabilities to conduct an airmobile insertion into the Omar fields, force a river crossing and advance to a link up with the airmobile force. All depends on the disposition and strength of IS defenses and how fast the R+6 could put such a complicated operation into action. To the north, in Deir Ezzor itself, what’s left of the IS jihadis in the city are now cut off from reinforcement, resupply and any hope of a retreat. The R+6 forces on the east side of the Euphrates, spearheaded by elements of the 5th Legion, drove north and cut off the last IS lines of communication into the city. To the south, Iraqi PMU and Army units are massing just east of Rawa and are preparing to launch an operation to liberate al-Qa’im. The distance from Rawa to al-Qa’im is roughly the same as from Al Mayadin to Al Bukamal, about 80 kilometers. 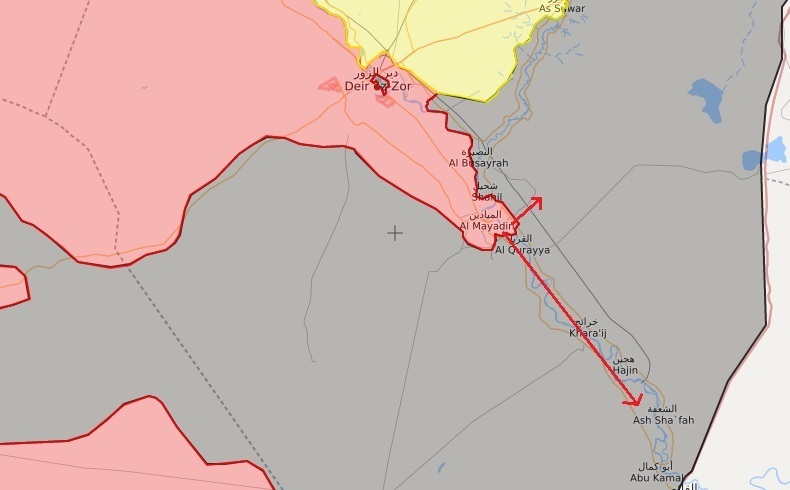 Not only would this Iraqi offensive pull IS forces away from the R+6 drive to Al Bukamal, but the success of both these drives would finally open up the main Bagdad-Damascus highway. I don't think the CJTF-OIR will be sending anybody any congratulations cards. Just imagine what Bibi will do. Perhaps he will scream in rage and drive his right foot so far into the ground that he creates a chasm and falls into it, never to be seen again. I can hardly wait. Far from Deir Ezzor, a Turkish Army column entered Syria to take on some variety of jihadi in Idlib. The government in Damascus issued a statement calling for the removal of these Turkish troops. At the same time, a captured Syrian pilot was finally released by the Turks. I get the feeling this has all been arranged by Moscow and the Syrian protest is largely theatrical. In the meantime, jihadis are still killing jihadis in Idlib. Good.